New songs! Trip to Barracão da Capoeira, Brazil! Got back from Brazil, and more specifically, Guaratinguetá, a few days ago. I spent eight nights there, at Barracão da Capoeira’s first ever VIVÊNCIA CULTURAL BAOBÁ: Barracão da Capoeira ramificando cultura. It was my first time there and what stayed with me the most, apart from the amazing people, was Barracão: the building itself. I would have been happy to stay in there a lot longer, as the place has something about it which made me want to practice non-stop. Whenever I was there I would either start training or play one of the instruments. 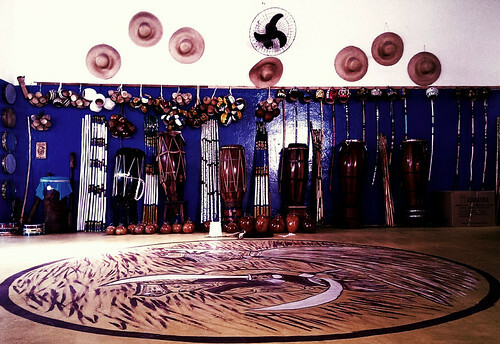 Mestre Ze Antonio’s school – university, actually – is also a temple of Capoeira. A very special place – one that will stay with me forever. Wall at Barracao da Capoeira. The rodas on the floor, recently painted by Pirata, a local artist. Photos here. I didn’t take my heavy camera, because it’s, erm, heavy. So it’s phone photos only I’m afraid. Another one by Mestre Zé Antonio. Only have the lyrics for this one, which is about obstacles in life. This song comes from Jongo. We learned quite a bit about Jongo’s history and how to dance it with Vivência de Jongo Quilombolas Tamandaré (Mestre Jefinho Tamandaré). There’s a joke that 3D existed in jongo way before modern times. Defesa, Devoção e Diversão! The three jongo drums, one for defense(capoeira), one for devotion(candomble) and one for fun (samba). Professora Bia sang this one, by CM Marivan from João Pessoa.